Google’s Mobile First Index is not expected to go live until some time next year (2018). But that doesn’t mean you should wait until 2018 to make sure your site conforms to the mobile search criteria. Prepare now and you’ll get the “ready now” bonus when Google starts crawling sites for inclusion in the new index. Google Will Roll Out Mobile-First Index to Individual Sites That Are Ready by Matt Southern, Search Engine Journal July 3, 2017 When Google rolls out its mobile-first index, it will begin by indexing individual sites that are ready for it. This was confirmed by John Mueller in a recent Google Webmaster Central office-hours hangout. Mueller went on to say sites may or may not be informed the mobile-first switch has changed for them. This presents a challenge when it comes to tracking analytics and ranking positions. On the positive side, with Google rolling out the mobile-first index on a per-site basis, those that are prepared have a good chance of being indexed before others. Those that aren’t ready for the mobile-first switch will have to wait a bit longer to be indexed, Mueller says. This can be seen a positive thing for both searchers and site owners. Searchers will see only the most mobile-friendly sites, as intended, while site owners who have put in work preparing for the mobile-first index will be rewarded with priority indexing. Read more… Check here if to see your site is mobile-friendly. From a recent post by LSA Insider, 57% Unlikely to Buy Online from Biz with Poor Mobile Experience: Studies continue to show that poor mobile experiences result in businesses and brands being overlooked by customers. According to a new study, 57% of consumers said they were not likely to buy online from a non-mobile friendly local business site. This applies equally to national brands as well. While the finding is logical as it relates to ecommerce, it’s a stand-in for a broader proposition: not delivering good digital/online experiences will result in a loss of good will and purchases of local consumers. 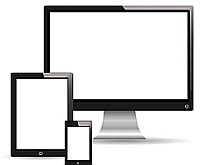 For small business owners, this underscores the fact that you not only need to be online to be found by potential customers or clients, but that your website needs to be responsive, i.e., fully accessible and user-friendly when viewed with a tablet or smart phone. Indeed, with the increasing emphasis on mobile-friendly websites by Google and other search engines, customers trying to find products or services may not even see your business in search listings if it’s not responsive. Contact us today for a quote on an affordable website for YOUR small business.